Philippine Airlines (PAL) recently unveiled a long-awaited enhancement of its inflight products with the introduction of renowned guest chefs and a restyled menu that features a variety of international cuisines reflecting the global profile of the flag carrier’s passengers. The changes are part of PAL’s thrust to ramp up its customer innovations under its new management led by conglomerate San Miguel Corporation. The new cuisines, which kick off the “PAL Master Chef” series of the airline’s catering operations unit, are anchored on the exceptional skills of its five guest chefs – all accomplished masters of the kitchen – representing different culinary specialties. Leading the new team is the celebrated Fernando Aracama, avant-garde advocate of Filipino gastronomy and executive chef of the eponymous Aracama at The Fort in Taguig City, which recently opened to rave reviews. For PAL’s domestic and international services, Aracama will create Filipino menus that evoke the rich ethnic palates of the islands, but with a modern twist. His signature dish, manok sa tanglad (grilled chicken in lemongrass) with kalo kalo (annatto garlic oil fried rice) and cucumber cilantro salad, is a throwback to his childhood years in Bacolod, where his mother’s home cooking sparked his interest in culinary arts. For fans of Western cuisine on PAL’s international services, legendary Irish chef and restaurateur William “Billy” King will handle the kitchen chores. A long-time resident of Manila and former executive chef of Hotel Inter-Continental’s Prince Albert Rotisserie, King revolutionized the local fine-dining scene in the 1990s when he opened Le Soufflé in Makati and Le Chef Manor in Baguio. He now brings his trademark clean and neo-classical approach to his initial foray into airline inflight cooking. “When it comes to food, I am easily inspired. I love a challenge and am excited to create something that guests of PAL will enjoy,” he says. King’s contribution to the PAL menu – slow-cooked U.S. Angus beef with balsamic jus, horseradish cream with pureed carrot and potato, and leek confit – bears the refined, haute-cuisine style that made him famous. With Asian routes making up over two-thirds of PAL’s international network, the flag carrier has brought on board three Asian chefs specializing in the continent’s major cuisines to delight its passengers. The ever-popular Chinese menu, served on the airline’s China services, will be prepared by veteran Malaysian chef See Cheong Yan. Formerly executive chef with the Shangri-La group of hotels and currently the culinary director of leading hospitality school Enderun Colleges in Taguig, See has over 30 years of experience in kitchens and classrooms from Malaysia to Switzerland, from China to the United States. Employing his characteristic meticulous approach to cooking, See marinates his U.S. beef short ribs with a soy sauce mix and slow-cooks it for 48 hours to ensure tenderness. The sauce is then prepared from the marinade, combined with honey, shallots and peppercorn, to complement the meat. “The robust taste of the sauce matches very well with the tender braised beef. I’m sure our passengers will enjoy it,” he says. For travelers on PAL’s Japan services, the task of pleasing their palates is taken up by Masahiro Mizumoto. The executive chef of Kitsho, the famed Japanese restaurant of Trader’s Hotel Manila, brings prodigious talent honed by 27 years of experience to the task, making him a master of the craft. Indeed, Mizumoto is the only professional chef in the Philippines licensed to prepare fugu, the exotic but hazardous delicacy made from toxin-laden puffer fish that is nevertheless one of the most celebrated dishes in Japanese cuisine. For PAL, Mizumoto has created a dish that’s no less desired but far more agreeable to the taste buds: buta kakuni, organic pork belly steeped in bonito flakes soup stock, and dark and light soy sauce garnished with soybeans and flavored with yellow Japanese mustard. Finally, a new addition to the PAL menu is Thai cuisine, overseen by one of its best exponents, Khun Suwanna Puangdee, executive chef of Dusit Thani Manila’s flagship restaurant Benjarong. Steeped in both classical Thai cooking as well as international cuisines, Puangdee vows to “mesmerize” passengers on PAL’s Southeast Asian services with authentic and diverse flavors of homeland. Her signature dish, pla kraqpong jean nam makham (deep-fried fish fillet in tamarind sauce), certainly accomplishes this. The deep-fried fish fillet is enhanced by minced pork, mushrooms, spring onion and bell peppers. Bringing the dish alive is the zesty tamarind sauce and its sweet, sour and spicy flavors. "Many have come to appreciate this popular dish from the wide collection of Thai cuisine. I chose this dish to bring out the uniqueness of Thai cuisine and the authenticity of flavors using local spices and herbs. It is such a pride to be able to share them with more people. I hope these will have a lasting impression of Thai culture and cuisine on everyone." says Puangdee. 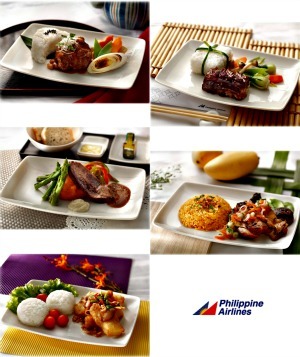 The new menus will be gradually introduced on PAL flights starting April 2013. These will run in varying cycles on the flag carrier’s intercontinental, Asian regional and domestic services until 2015.